For several years we’ve had a UCI rule in place, it requires the saddle to be placed at least 5cm behind the bottom bracket in all events other than track sprint or kilo, with the end of TT bars to be not more than 75cm forward of the bottom bracket. This is being changed for 2014, it’s long overdue. 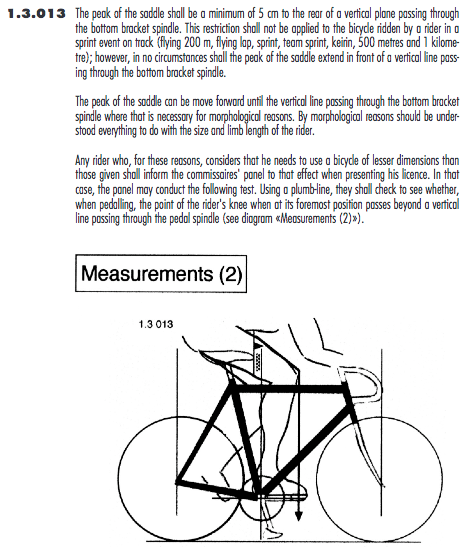 A morphological exemption was required to allow you to deviate from the rules, this demanded approval from the commissaires of the event you were riding, who then used a plumb line and a measuring device to determine if your application was valid. As you can imagine, this can be open to interpretation or ignored completely due to time constraints, it’s very easy to say no & the comms decision is final. So somebody having trained in one position & then being told they can’t ride it on the big race day isn’t exactly ideal. In the UCI’s February Sport & Technical communication they stated that 80% of riders were claiming morphological exemptions before the start of the race, so the rule has become unworkable & very time-consuming for officials. From 2014 onwards the rules will be slightly different in concept, but very different in real terms, as it will allow a bit of certainty & consistency in bike setup for time trials, pursuits, team pursuits & domestic record attempts outside the UCI Hour Record rules, which hopefully will also be changed. The rider will get to choose to just one of these previous morphological exemptions, regardless of whether or not they’ve been measured by the event commissaires. Effectively, everybody gets a morphological exception, but only one of the two, there will be no circumstances where they will both be allowed. You will be allowed your saddle up to a vertical line at the bottom bracket, or you will be allowed the end of your handlebars up to 80cm in front of the bottom bracket. 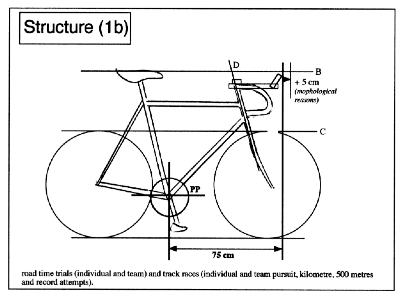 The rider is therefore not required to attend the bike measurement from this point on, your bike can be measured on the jig, reducing time & complication at events, while giving everybody clear guidelines on how to set up their bike without any room for interpretation. There are other changes too, previously tri-bars had to be flat, you are now allowed a 10cm differential in height & the 75cm/80cm rule now includes your gear levers, measured to the point they extend to when positioned in line with the bars. You can see more information on the UCI’s October Sport & Technical communication for information on rule implementation, plus the details of the new rules from the UCI’s February communication. How will the rule changes affect riders? Moving your saddle 5cm forward doesn’t sound like much, but bear in mind there are now many products on the market that help mimic this, by creating shortened time trial saddles manufacturers know there is a desire to move further forward. It’s all about aerodynamics, being able to get your body into a more streamline position & still be able to produce the watts. Your thigh/torso angle is crucial here, as that angle gets smaller & your back gets lower you lose power through the pedals. So there’s a ‘sweet spot’, where for a target speed you can’t get your back any lower without recording a slower time. Having your saddle pushed forward allows you to open up this angle slightly, getting more aero without losing power, so if you choose this method (of the two options) you should be able to go faster. The 75cm rule being extended 5cm will also make you more aero, see Graeme Obree’s ‘Superman Position’ for an exaggerated effect of this. In practice, it’s likely that riders will choose to move their saddles forward by 5cm, rather than extend their arms by the same distance. This is down to the relaxing of the tri-bar angle rule, so you can compensate for the arm extension by tilting your arms upwards while benefitting from the lower position allowed by a further forward saddle position. This also ‘closes the cup’ & has an effect to stop air rushing between your arms & your head & hitting your thighs to slow you down, while lowering your shoulders. So the new position could actually be faster than the current one, but only wind tunnels will tell this for sure, the teams & nations will be testing this now. There’s certainly plenty for the amateur cyclist to look at in the meantime with a quick study over the changes. In general, the rules are not applied to time trialling in Scotland, this has been a bit of a controversial subject over the last couple of years, as applying the full UCI rules to TT’s will exclude plenty of old-school machines & some triathlon equipment which contravenes the aero tube profile rules. So it’s unlikely that the rules will be fully applied to TT’s, but we really don’t know, especially as these changes may make some of the positions legal. Lots of recent Scottish TT championships have been won on positions that do not comply with UCI rules, a quick look at the side profile of our champions in action will show just how far forward their positions lie. The track is a different matter, bikes are measured for championships & riders will have to conform, it’s all a bit more up to speed with modernity. The jigs will have to be modified or re-issued for 2014, but track racing will be UCI compliant. Hopefully the commissaires will be up to speed, otherwise there will be a gap between what’s legal in Scotland & what’s legal everywhere else, especially important for avoiding any embarrassing questions at the Commonwealth Games. The individuals involved in the Scottish Commissaire Commission are usually on the ball, the info just needs fed down to all commissaires who will be working on any track events, then applied to all Scottish track events from 1st January 2014. If you race track pursuit, or intend to, it’s probably going to affect you. If you intend racing internationally, then you really need to become aware of the UCI rules & how they are implemented, so it’s best practice to adopt them on your TT bike now. If you’re racing domestic TT’s, then keep an eye on any announcements from Scottish Cycling regarding positions. I’d prefer these to be adopted in TT’s, at least in championships, in order to give a consistent ruling across all disciplines, possibly disregarding the other aero rules so everybody can ride their old bikes. The position changes are easily adopted & will give a comparison of ruling between Scottish events & international events, currently the rest of the UK operates under CTT rules, which conform to no international ruling, this is one area of cycle racing where Scotland can be forward thinking compared to the rest of the UK. It’s time to get the measuring tape out, a turbo, a spirit level & plumb line & see how close you can get to the rules. As Chris Boardman said, the rules are there for you to bump-up-to, they describe what a fast position is, so it’s up to you to get as close to the limits as legally possible to make your body cut through the wind more efficiently. Happy measuring.